In the early 1960s, Rialto Film in West Germany began filming a series of Westerns based on the classic adventure novels by writer Karl May. They told fantastical and very romanticised tales of the Old West and proved highly popular with audiences. The success did not go unnoticed in East Germany and the State film company DEFA set out to create their own Western. Adapted for the screen by Liselotte Welskopf-Henrich, from her own eponymous series of novels, Die Söhne der großen Bärin is like her books, an attempt to tell the real story of the Old West, rather than just to use it as a background for a fictional adventure story (something she accused the Karl May books of). A loyal member of the Socialist Unity Party that ruled East Germany at the time, she used the books and screenplay to highlight the injustices carried out by the American settlers against the Native Americans, in particular the history of the Sioux tribes at the time of the Black Hills War. However, although essentially propaganda, the screenplay never exaggerates the American actions against the Sioux and in fact, probably due to censorship issues, misses out a lot of the historically recorded brutality. As a film script, Welskopf-Henrich's work is rather amateurish - pacing is slow and often drags, the dialogue is often quite poor, leading to some quite absurd situations (two tribe leaders trying to settle an argument end up in a fight to the death by simply declaring that they will have a fight to the death) and characterisation is poor - vague efforts are made to add a romantic link between Tokei-Ihto and one of the tribal women, but it never comes off as any more than a token attempt. There seem to be a number of gaps in the storyline and unexplained aspects - the introduction of a rivalry with another Indian tribe comes out of nowhere. Ultimately no particular tension is built up when the film comes to a climax in an over-long duel scene and the sequence and saccarine ending certainly do not gel with Welskopf-Henrich's idea of creating a realistic story over a plain adventure yarn. Behind the camera, director Josef Mach does some good work - the interior and dialogue scenes are adeptly handled and many of the exteriors are well handled, however the direction and editing of the fight scenes is quite poor - the use of sped up footage and muzzle-flash effects makes these scenes more remniscent of 1930s Hollywood B-Westerns than the slickly helmed Karl May Westerns. The evidently limited budget can be seen in the very small scale of the whole production - the Sioux tribe seems to number around 40 and the US Army in the region has even fewer men, but the sets look good and the Montenegrin exteriors are amazing. The soundtrack, credited to composer Wilhelm Neef, includes a main theme very similar to that of the Karl May Westerns while the rest of the score appears to be library music which is used overly sparingly, leaving many action scenes to play out in silence and many other scenes to be backed with quite inappropriate jazzy themes. Jugoslavian born Gojko Mitic had made a few appearances as a Native American in the Karl May Western series, including a major part in Frontier Hellcat and he was picked out for the leading role in this film by the DEFA producers. His presence in the film is very impressive and he certainly looks the part; his acting is less impressive although this might have more to do with the limited script. His rival Red Fox is played by Czech actor Jirí Vrstála, best known for his comic roles as Clown Ferdinand, but who manages to give a genuinely menacing performance as the villain. 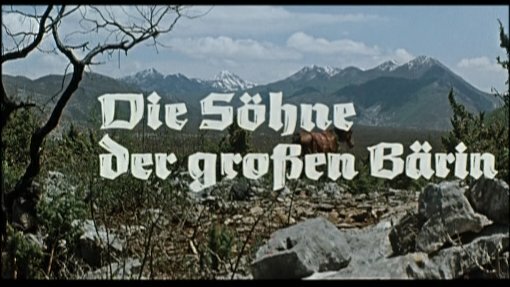 Slowly paced and poorly written, Die Söhne der großen Bärin does not stand up very well today, particularly when compared to the well made and epic scale Karl May Westerns which which it tried to compete, but it provide exciting enough for the East German audiences to demand more of the same and it began a long running series. For that reason alone, the film is worth watching. Directed by anyone	interesting? Josef Mach - a Czech born writer and director who worked on a large number of films in Czechoslovakia, dating back to the 1940s, none of which ever gained much notice in the West. Who is it for? Of historical interest to fans of the European Westerns wanting to find something new. Visuals Aspect Ratio - 1.85:1. Not anamorphically enhanced. Colour. Aspect ratio unconfirmed, no cropping is particularly evident. A little grain and damage but otherwise quality is strong with good colours and detail. Audio German audio - sounds fine. Subtitles English - translate the German. Interview with Gojko Mitic - he discusses how he came into films and this film in particular. In German with English subs (9 minutes). On screen text notes on the background to the film. Brief on screen text biographies of the two leading actors and the director. Picture gallery - manually scrolling publicity stills for this film as well as 'Apachen' and 'Chingachgook, die grosse Schlange'. Availability Available on its own or in the Westerns with a Twist boxset, along with 'Apachen' and 'Chingachgook, die grosse Schlange'. Other regions? Also available on DVD in Germany, with no English options. Cuts? Cut status unconfirmed - there do appear to be scenes missing, but this could just be poor editing and scripting. German language print. A rather poorly written film, it is of historical significance and will be of interest to Euro-Western fans. A perfectly good looking print with good audio and subtitles as well as some useful extras to put the film into context - it is only a pity that it is non-anamorphic. Find more details about the Westerns with a Twist boxset. All text in this review written by Timothy Young - 31st July 2009.